Myth: the term “scot free” has its origins from the Dred Scott v. Sandford U.S. Supreme Court Case. “Scot free”, also sometimes written “scotfree”, “scot-free” or, incorrectly, as “Scott free” actually pre-dates the Dred Scott Supreme Court ruling in 1857 by a very large margin (having been around since at least the 11th century). Another common misconception is that the phrase has some association with the Scottish. In fact, “scot”, in this case, is from the Old Norse word “skot” meaning something to the effect of “payment” or “contribution”. In English, “scot” initially just meant “tax”. The phrase scot free was first used in reference to municipal tax levies. Each person in a town would be obligated to pay a share of the scot (tax), which was called their “lot”. In some areas, you also were not allowed to vote unless you paid your lot of the scot. Those who didn’t pay, such as the poor or those wealthy individuals that could get out of it, were then “scot free”. Thus, initially, the term more or less just implied you got out of paying your taxes. It quickly spread to being used whenever someone got out of paying anything they should have, monetarily speaking. Today, it is also used in reference to non-monetary forms of payment, such as someone who commits a crime, but then gets off “scot free”, without being punished in any way for their crime. The Dred Scott v. Sandford case has since given rise to the false etymology that it had something to do with this Supreme Court ruling on whether Dred Scot and his family should be free or not. For those not familiar, Dred Scott was a slave, born in Virginia somewhere between 1795-1799 who ultimately played a large role in accelerating the start of the U.S. Civil War and indirectly helped popularize the Republican Party. Scott originally was owned by the Peter Blow family but was sold to Dr. John Emerson who moved around a lot due to being a doctor in the U.S. army. 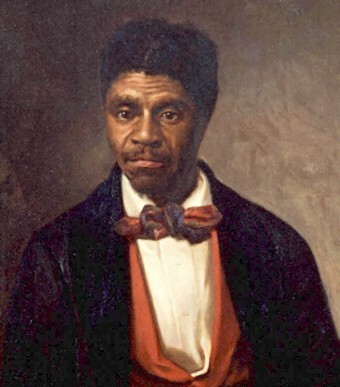 During this time, Dred Scott found himself living briefly in Illinois (a free state) and the Wisconsin Territory (in present day Minnesota) where slavery was outlawed. As such, at around 47-51 years old, even though he was at the time living in a non-free territory, he petitioned for his freedom on the grounds that when he was in those free territories, he should then have been automatically free, both by state laws and by the Northwest Ordinance of 1787. He filed suit initially on April 6th, 1846 with the courts to have himself and his wife and two daughters freed. Why he waited so long to do so isn’t known. It is speculated that he didn’t know of the law at the time, so didn’t bring the matter up while living in those free regions. This first suit was dismissed due to insufficient evidence, but the court allowed Scott to re-file. During the second trial, the jury ruled in the Scott family’s favor and proclaimed them free due to the fact that Dr. Emerson had illegally held him as a slave while Scott lived in free regions. However, this decision was appealed and the Missouri State Supreme Court ruled against the Scotts in 1852. This was particularly significant because it overturned the firmly established “once free, always free” precedent, with Scott and his family having been free during the interim of the jury’s ruling and the State Supreme Court’s ruling. After another failed suit, the case was brought before the U.S. Supreme Court: Dred Scott v. Sandford (note: the court misspelled Sanford as Sandford). They ruled against him 7-2, stating that as he was of African descent, he had no rights as a citizen of the U.S. and, thus, could not file suit against anyone in a U.S. court. This was contrary to common practice in free states where many allowed freed slaves to become citizens. As such, because the Supreme Court is the highest court in the land, it effectively nullified those people’s citizenship. Their ruling also overturned the Missouri Compromise as unconstitutional because it would allow slave owners to be deprived of their property (slaves) without any sort of due process (if the slave owners traveled through or moved to a territory where slavery was outlawed), which violated the Fifth Amendment. Needless to say, the Supreme Court’s ruling outraged abolitionists who had recently formed the Republican Party three years before in 1854 with one of their primary goals being to stop the spread of slavery. The ruling became hotly debated throughout the country, polarizing many individuals on the issue of slavery and ultimately bolstering the new Republican Party’s numbers, helping to eventually get Abraham Lincoln elected as President in 1860 as the first Republican U.S. President. After the ruling, the Scotts were given back to the Blow family, who had originally owned them. The Blows subsequently granted them their freedom in 1857. Unfortunately, Dred Scott didn’t get to enjoy this too long as he died of tuberculosis a year later, but at least his family was free and his court case was pivotal in accelerating the process that would ultimately lead to the freedom of all slaves in the United States. The Supreme Court’s ruling in the Dred Scott case technically still stands to this day (having never been directly overruled by the Supreme Court since then). However, the Thirteenth and Fourteenth Amendments have effectively done the work of overruling the court’s decision in the Dred Scott case. The Thirteenth Amendment outlawed slavery and the Fourteenth Amendment, among other things, provides a citizenship clause which allowed people of African descent (and others) to become citizens of the United States. Many historians think that Dred Scott’s name was not originally “Dred”, but, rather, “Sam”. He had an older brother named “Dred” that died, at which point Sam chose to take his brother’s name. Dred Scott’s wife, Harriet, was owned by Major Lawrence Taliaferro and was just a teenager when Dred married her (even though he was nearing his 40s at the time). Scott asked permission to marry Harriet, which was granted, and Taliaferro further agreed to transfer ownership of Harriet to Dr. Emerson so Dred and Harriet could live together. The Dred Scott ruling by the Supreme Court was only the second instance of the Supreme Court declaring that an Act of Congress was unconstitutional. The first was around 50 years before in the case of Marbury v. Madison. While it wasn’t the cause, the Dred Scott ruling did help to trigger the Panic of 1857, due to economists being worried over whether the free states and territories would now be slave states and if that would result in anarchy within those regions. After its formation in 1854, the Republican Party quickly grew to dominate the Northern States, seeing its first party member to become president in 1860, Abraham Lincoln (not a bad turn-around, taking only 6 years from the party’s inception). One of their earliest campaign slogans was “free soil, free silver, free men, Frémont”, which was a slogan used during John C. Fremont’s failed bid for the presidency in 1856. Interestingly, during this time in the South, the Republican Party was branded as a radical group that wanted to break up the nation via a civil war. The Republican Party being strongly supported by various groups of Christians goes all the way back to its origins where among its strongest initial supporters were the Presbyterians, Methodists, Lutherans, and Quakers, who almost universally supported the party from its inception. Interestingly, despite the overall strong support from the various Christian groups, the Roman Catholic church almost exclusively rejected the Republican Party in its early days, generally supporting the Democratic party instead. You need to research more. The word scot-free can be found in late 1500’s literature. You can google scot-free and Greene for proof. Cool story you have but not the origin of word. Great article. Everyone I know used to say “scotch free” so it is great to know the origins and that the actual term is “scot free” which initially meant free from paying tax. “Scot free” love learning stuff like this, even more, the political history connected..! Who would have thunk the republicans were the good guys…. Boggles the mind, don’t it? Aren’t we getting a little picky!! Is thunk a real word? Scott free, scot free, what does it matter from what I read it could be either! Depends on how you interpret it! FYI I don’t like it when someone misspells words especially when in print! And why didn’t spell check correct it if he misspelled it? I think everyone has that feature!